This is our true Patriotic Bow: Red White and Blue Stars and Stripes Forever! 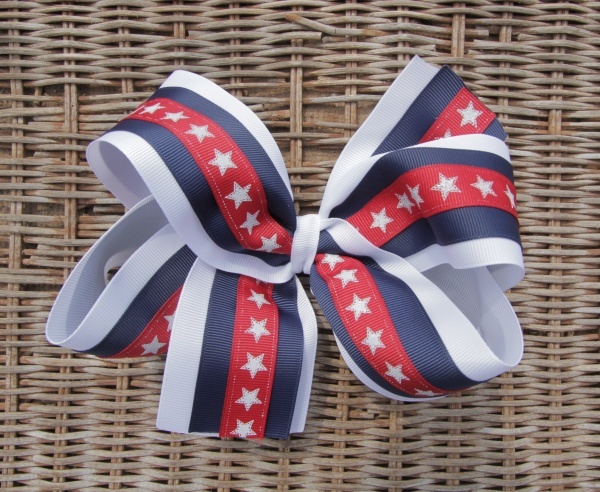 Triple layers to show off our great American country, which makes this the perfect bow for all of our American Holidays. The bottom layer is a white 2.25" grosgrain, with a 1.5" navy grosgrain in the middle, topped off with a 5/8" red with white star grosgrain ribbon. The stars have a shiny silver sparkle on them which helps to show them off. It is wrapped together with a white grosgrain ribbon and attached to a French clip. Ready to go for your next celebration.